Childbirth Classes (Childbirth Education and Yoga For Labor Workshop). Our class packages are extremely flexible. There is no minimum commitment, no series of classes, and no expiration date. You can pay as you go, or for more discounted prices per class, you can buy a package of classes that never expire. You can come as often as you like, and to any of our conveniently scheduled classes. It is not necessary to pre-register for classes. Just come in and take a yoga class! All of our instructors have extensive and specialized training, which means classes are carefully planned and carried, but you can always come to a class with a special request that will be met. Our groups are small to ensure lots of personal attention and a more intimate setting. Prenatal class packages may transfer to Mom & Baby Yoga and Pilates classes. We also offer private sessions at our studio, your home or office. Private sessions can be 60 or 90 minutes long and require an appointment. Can't make it to class? Check our our YouTube channel for some great Prenatal videos. Personal questions regarding your pregancy? 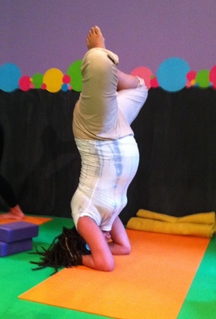 Email Juliana Secches, our Prenatal Yoga Director at prenatal@karmakidsyoga.com. "I just wanted to write and tell you how thankful I was that I went to prenatal Pilate's and yoga on a regular basis during my pregnancy. My baby was sunny side up which caused some difficulties especially during transition. I had to be very active during labor and the midwife had me changing positions very often in an attempt to get the baby to turn. I was stuck at 8cm for 2 hours and the midwife had to manually complete my dilation in the end. The baby also "got stuck" while pushing and multiple positions had to be used to allow him to be born. His heart rate kept dropping and they were threatening to take me upstairs for a c section, they even brought a gurnie to my room. In the end I was was able to deliver him naturally. I know that I would have ended up with a c section if I was not in good physical shape. I used every muscle in my body during the labor and I was so happy for all the squats and core work that we did in class. Also the exercises on holding painful positions for a minute were extremely helpful to me mentally. Every time I had a contraction, I kept thinking about how in class I was able to hold the position longer than I thought possible and that it would eventually end. "I started taking prenatal yoga at Karma Kids with Annie at the start of my second trimester and loved it. It was such a great mix of relaxation and challenging poses and I continued with it right until I gave birth. Annie's focus on ab strength was exceptionally helpful. Right after I gave birth, my midwife commented that I had a large four finger separation in my abs (diastasis recti) and I would need to work really hard to repair them. I was really bummed. When I told Annie, she suggested I keep doing simple ab work we had done in class. I did them religiously (sitting on the couch) and at my 6 week postpartum check up, my abs had no separation whatsoever! My midwife was shocked and said "If you're abs are this strong now, what where they like before you were pregnant?" "I'm very grateful for the support I have found at Karma Kids Yoga. We miscarried a couple of years ago and had already purchased a Prenatal package of classes...When I shared our heartbreaking news, I was consoled and reassured to: "Not worry....just come backwhen you get pregnant again...". That open, generous and positive attitude was beyond comforting to me and my partner and gave us peace of mind to trust, accept and let go. Two years later we conceived and I have practiced Yoga and Pilates throughout my blessed and healthy pregancy. I feel awesome! Truly, all of the teachers and classes are amazing at Karma Kids Yoga because they are challenging yet always encourage moms to practice from their own comfort levels. Juliana is not only a no BS, smart, knowledgeable teacher, she also cares about how we mothers are navigating through our respective journeys, ie. she gave me a list of referrals to help us on our doula search...so helpful! Friday morning classes with Ginger are a real gem...one of NY's best kept secrets!